This DIY requires cheap materials available at a stationery shop. PUBG has been all the craze, especially since it launched on mobile platforms. Playing it the usual way is always fun, but using a controller is often preferred by players seeking an additional degree of precision. 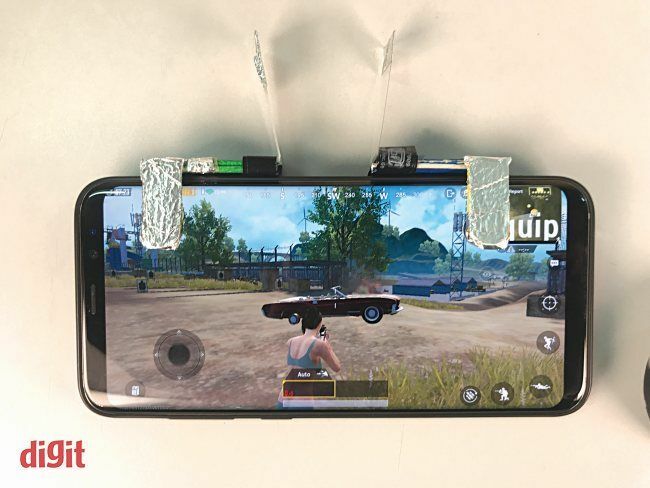 If you’re someone who prefers controllers over tapping your screen, how would you feel about building your own PUBG controller for your smartphone? Here’s how you can do that. Craft ice cream sticks are available, which are nice and colourful but may not be of a uniform size. This includes both the width, as well as the thickness. However, if the ice cream sticks are not of a uniform size, it can actually work to your advantage. The sticks required for the base of the trigger can be chosen deoending on the thickness of the phone. The thinner ice cream sticks are also easier to cut with scissors. Disposable wooden spoons or forks can also be used. If you get your hands on aluminum tape, then there is no need for the aluminum sheet and double sided tape. All the parts required for the build should be available for less than Rs. 200. This is the most important step towards making sure that the triggers work as intended. To set up the triggers, it is a good idea to change the control options in the training mode. Go to Settings > Controls > Customise. This allows you to drag around the buttons anywhere on the screen, as well as adjust their size and transparency. It is a good idea to make the buttons nice and big, but you can increase the transparency to compensate. The buttons will be hidden under the arms of the controller anyway. Make sure that you do not place any buttons from the top edge of the screen, till where the controller buttons are located. Once this is done, it is a good idea to measure the distance from the top of the screen, to where your button is placed. This will decide the length of the front arms of your controller. The complete build involves a pair of controllers, but you can just as well use just one. Once you have all your measurements, we can get to building the trigger. The first step is cutting up the sticks to create two triggers. You need two rectangular pieces to sit on top of the phone. The front and back pieces for the phone can have the rounded ends on one side. The back piece, and the two top pieces can measure 3.5 cm. We used a 2.5 cm piece for the front, but this can be modified according to your button placing and size of the phone. It is good to keep the piece less than 3.5 cm. Mark all these out on the ice cream sticks, and cut them up. 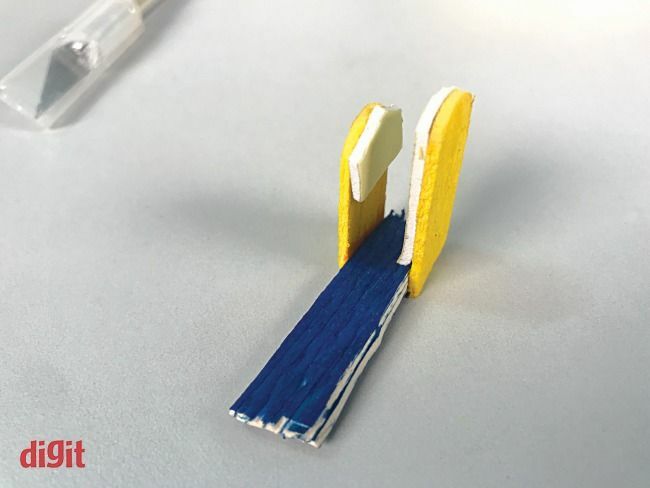 You need two sets for the left and right controller, so after this step, you should have 4x 3.5 cm long rectangular pieces, two 3.5 cm long rounded edge pieces and two 2.5 cm long rounded edge pieces. Now stick two of the rectangular pieces together. 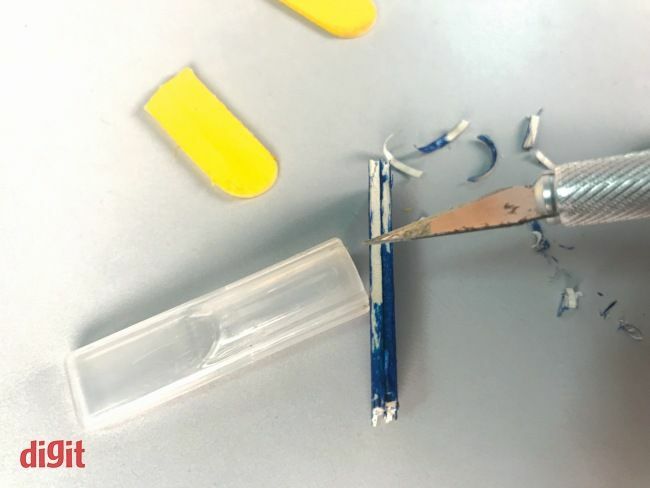 If they do not align properly during the sticking, or they are not the same size anyway to begin with, shave away the sides with the pen knife till you get a nice flat edge. 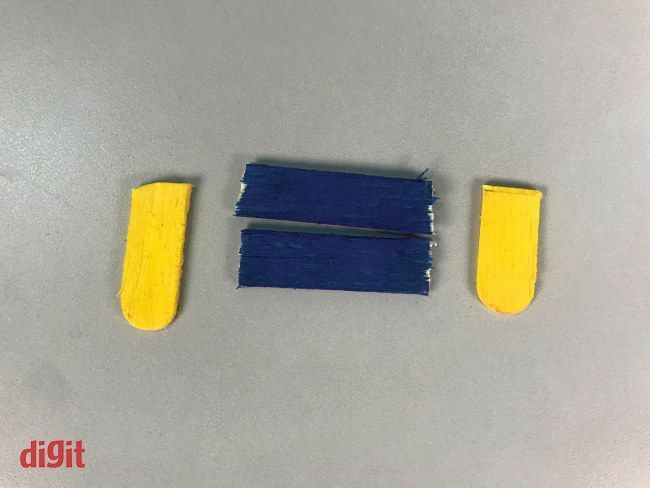 It is also a good idea to place the sticks on the phone, to check if the width matches perfectly. The width of the glued together sticks should be about 2 mm more than the width of the phone. If your phone is slim, then you might have to shave away a lot. This step is important as it ensures that the trigger fits snugly on the screen. Consider this the base for the right controller. You need to glue the other two rectangular pieces together for the left controller, then repeat the process. If the sides are a little distressed, the rough edges help with the sticking of the arms, which is the next step. In this step, the orientation is important or you will end up with two one sided triggers. We will first be sticking the smaller, front facing arm on both the triggers. This arm should be stuck on the left end of the right trigger, and the right end of the left trigger. On the opposite sides, the longer arms can be stuck, which will sit on the back side of the phone. Now, cut pieces of the double sided padding tape, and line it along the inside edge of the back arm. Cut away the portions that stick out with the pen knife or the scissors. This is the “wiring” part. First, take a small piece of double-sided padding tape, and stick it to the very bottom of the two front arms. 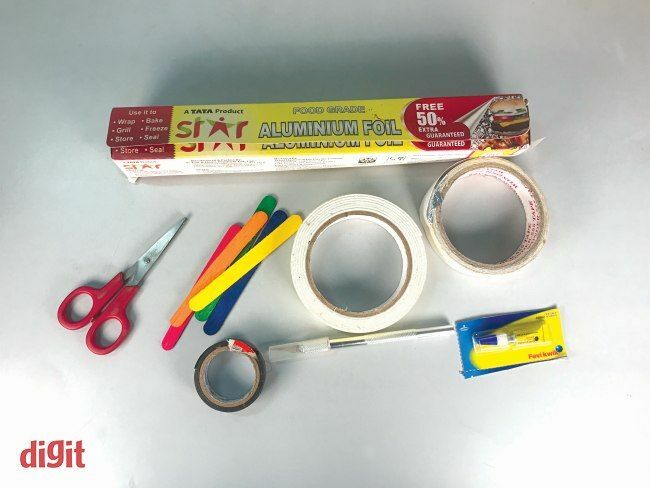 Peel off the top layer of the double sided tape, stick on a strip of aluminum foil so that it covers the tape perfectly. Cut away any excess foil. Then, cut away the aluminium tape and stick it on the front arm. It should cover the small piece of double sided tape, go around the front and over the top of the base, and a little bit over the back arm as well. The tape provides integrity to the structure of the trigger. Now you can use various materials for the triggers. We cut up the plastic from a visiting card case. Any hard-ish plastic, including discarded credit cards, will do. The trouble is instant glue may not be that great at sticking the particular kind of plastic. If it does not stick, use insulation tape. 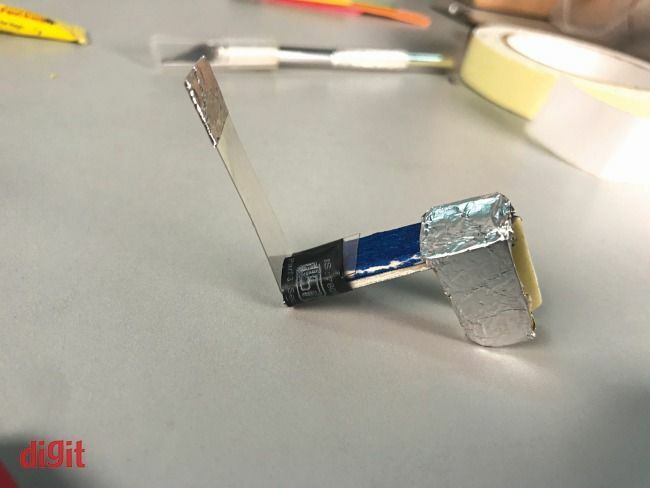 Essentially you cut a 4 cm long strip of the plastic, bend over about 1 cm of it, and stick it on top of the base – to the left side of the left trigger, and the right side of the right trigger. Now, you have to cut two small pieces of aluminum foil, and take it around the free sides of the two triggers. Now there are many things that can go wrong. If your triggers do not fit snugly enough, then the downward forces on the triggers can be interpreted as joystick inputs by the game. The front and back arms can be wonky if the base is not properly shaved and aligned. You can make the trigger fit more snugly by adding another layer of double sided padding tape on the back arm. Another option is to remove the arms, shave the base, and stick the arms back again. The double-sided aluminum tape is strong enough to remain sticky even when you dismantle the whole trigger. 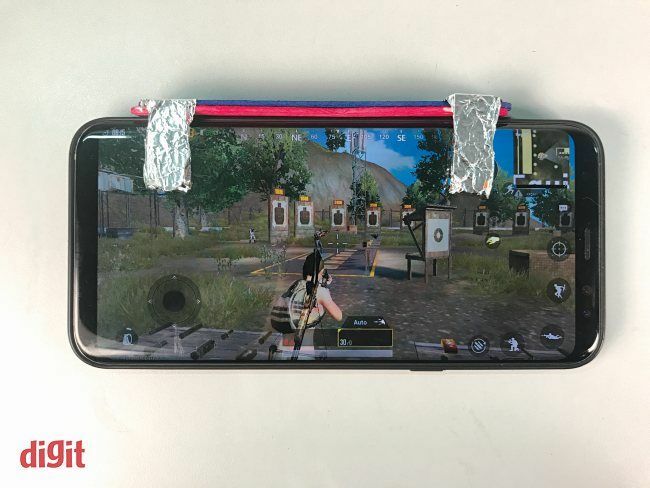 Make sure that the glue is totally dried before placing the triggers on your phone. The plastic triggers may not provide a satisfactory experience, so you might have to use a different material – or do away with the triggers entirely. The trigger so far is based on a video by TechBuilder. 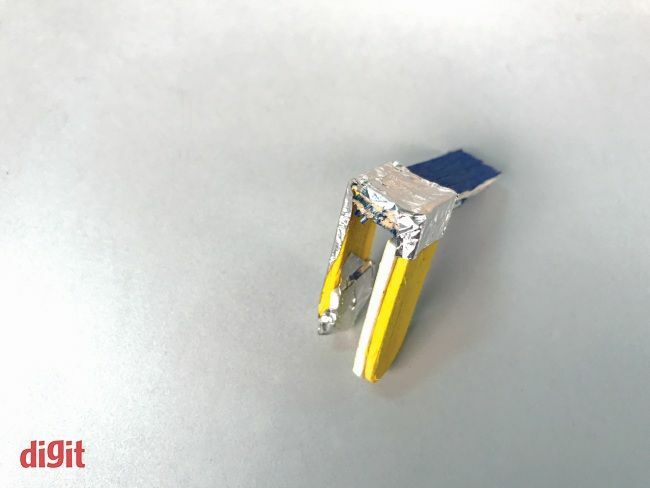 The way it works is that the input is transferred by the aluminium foil. It only works for short distances. There is no real need for the trigger, and we found that it was just unnecessary. You can directly tap on the aluminium foil, without needing the plastic triggers. This might be better and faster for some people. The build can also be done using two ice cream sticks stuck together for the base, needing fewer cuts. The four front and back arms can be stuck as required along the single base. Once it is built, you just have to directly tap on the aluminum foil to trigger the button presses while in the game.